With summer around the corner, I’m sure you are all feeling much the same way I am. I’ve booked my first spray tan for tonight, got all my waxing out the way and have started going for the summery Shellac nail colours on my hands and toes. I’ve also booked a Brazilian Blowout for tomorrow – so look forward to telling you how that goes. Anyway, one of my absolute pet hates is hard skin and after a long winter, I’m sure most of our feet are looking less than perfect. I know mine are from running, especially treadmill running – and nothing grosses me out more. 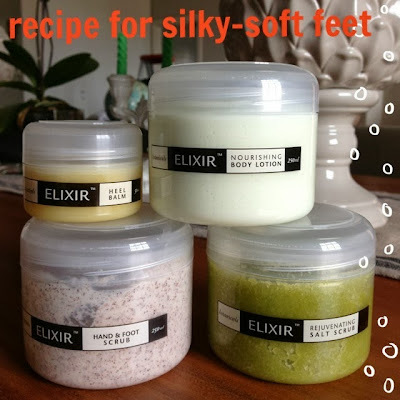 About a month ago I started setting aside a bit of time for my feet using the below products from Elixir. I seem to spend so much time on my hair and skin but neglect my feet when it comes to hydration. I go for a pedi every second week (religiously with my mani) but hard skin still creeps up on you. Elixir is a local aromatherapy-based facial and body brand that makes use of the finest essential oils and vegetable based raw ingredients. The reason I so enjoyed their foot care range is that the products really are as natural as you get plus they smell beautiful. Their scrubs were my absolute favourite as when I want to scrub my feet I want a real-deal scrub, and theirs is exactly that! This is what I deem to be a ‘real-deal’ scrub. It gets down to business and gets rid of all unwanted hard skin. It smells fabulous too. I only used this once a week as it is strong. I alternated this with the below product. This was a softer/milder version that the above so I used this every other day. It was great on my hands too and was full of beads that buffed the skin perfectly. I loved how natural this was. It was almost like a bees wax. I put this on overnight with some socks. Be sure to wash this off in the shower the next morning if you planning on wearing sandals, else you may find it a bit slippery. This was great for use over my heel balm for the rest of my foot as well as my legs. It absorbed perfectly and smelt wonderful. I then made use of this foot file from Woolies (you can get it here). I used this before I started the treatment on dry feet. Some people prefer doing this on wet feet; I don’t think it’s as effective. This is great to follow with the aforementioned treatment for the best results. I also popped some Essie cuticle oil on my nails afterwards. You can buy Elixir products online or check out their website for other stockists. Join their Facebook page here. I love ALL Elixir products, especially the fabulous Elixir Age-Defying B20 Cream. And the customer care they offer is outstanding – totally personal. I simply love the new Luminesense Oil. The results are awesome. Best skincare products by far - feet, face and body. I have been using their Pro Collagen Repair Cream for years now and I swear it's stopped the lines in their tracks! I've been using Elixir face creams for the last few years and I wouldn't swap them for any other brand now. I have incredibly dry skin and, for me, the the best and most nourishing creams are Ultimate Moisture and Repair Cream and the Lift and Boost Décolloté Cream. 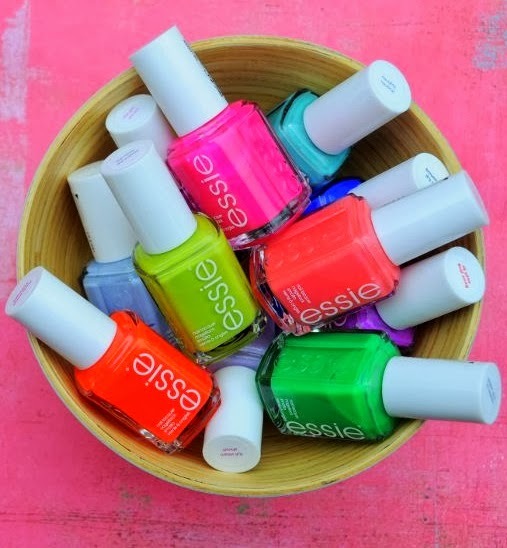 They just smell so lovely too - you get that real salon pampering feel when you use them. absolutely agree with you ! I am a therapist and I only sell and use and promote the Elixir products. love them. I am always doing specials for each month of the year and my clients are thrilled at the prospect of Elixir working hand in hand with me for their benefit. our ladies days are a hit and everyone goes away being inspired once again thanks to Judy and her great Elixir products.